Affiliate Marketing is an income sharing strategy where you can make money on the internet, easy to start building with no money to spend, providing you have your own website. 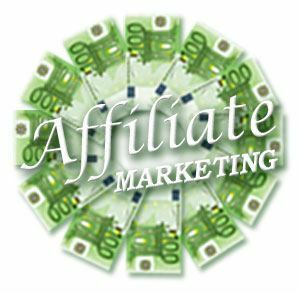 Affiliate Marketing allows you to promote products or services and receive commissions on sales, or on delivering an advertisement to web users. On your website, you place an advertisement (or banner) of another company’s product. Your visitor shows their interest by clicking the advert to open the product’s page, and you will potentially earn a small commission. There are broadly three types of advert payment methods; Pay Per Action (PPA), Pay Per Click (PPC) or Pay Per Thousands (PPM – “M” stands for Roman numeric for 1,000). Pay Per Action (PPA) – you will receive a commission on sales. Your visitor clicks the advert on your site and subsequently buys the product (=action), then you will get paid, usually % of the price. Pay Per Click (PPC) – as soon as your visitor clicks the advert, you’ll receive a small amount, can be as low as 3 – 30 cents. Pay Per Thousands (PPM) is when an advert has been displayed a thousand times, you’ll receive a commission. Your visitors don’t have to click or even view the advert itself. However advertisers who offer PPM commissions are very rare nowadays. In this page I will mainly explain how to get a Pay Per Action affiliate started from scratch. “Niche” is a category of the particular products/services, it is a category you want to promote. The niche can be anything in the world – books, clothing, solar lamps, nanny & childcare services…drain pipes…absolutely anything that people pay money for. You will then find affiliate programs with several companies (I will explain in later, No. 3), and promote the products/services on their behalf. Remember, the commissions you get paid is generally a percentage of the sale. Therefore you’d like to promote something that generates decent income for you. Also it should ideally be something that interests you, or something you feel passionate about, because you are promoting the product or service, you’ll need to write about it properly. Otherwise your visitor won’t believe what you say and won’t buy it. For example golf equipment is generally expensive, so you could potentially earn good commissions. But if you’ve never played golf in your life and have no knowledge, you’ll struggle to write about it – your visitors will know your content has been written out of your instant “Wiki-knowledge”. You may find your passion in the future and start playing golf yourself, but chances are that you’re not particularly interested in golf then you’ll likely to get bored of continuing your site business. It is generally said that the narrower the niche is, the better. I’ve mentioned “solar lamps” above, if your entire website was dedicated about solar lamps, the web user would see your site as a specialist. Imagine your site had a list and photo of garden lamps to mini pen-lights, “all solar lamps”, available from electrical store A, electrical store B, department store C… Your visitors would be able to compare qualities & prices all in one page. Also your website itself has to have a credibility. For example you are into fitness & healthy diet. You’d like to promote “how to lose fat” programs, how to eat healthily. But you also love solar lamps. Have you ever seen any websites who promotes diet AND solar lamps? That would be weird, your visitors would be confused, even if you had a valid reason for the combination. So if you have two totally different “niches”, it’s recommended that you should create two different websites. In order to own your website, you need to (a) buy your domain name, (b) find a web-hosting company and (c) website writing tool. (a) Buy your domain name means for example say, www.solarlampworld.com. It costs around $10 per year to own the name. Namecheap.com and Godaddy.com are popular for reliability, ease of use and reasonable prices. You can also check whether the domain name (e.g. “solarlampworld.com”) is available or not on these two domain name services. (b) Web-hosting company is where your website sits. All your website information is stored in their server, and publish your web (blog) posts for you. Web-hosting cost is around $50 – $150 per year, depending on the size of contents, speed, quality of support. There are cheaper web hosts less than $50 per year, but they’re unreliable (the server shuts down for fault for 24 hours, etc) therefore I wouldn’t recommend. (c) Website writing tool – currently WordPress is extremely popular among bloggers, retailers and marketers. You can download the tool from wordpress.org for free, and upload the contents to the web-hosting site (“b” above). Not to be confused with wordpress.com, where you can register for free, you don’t have to pay for web-hosting separately, but you cannot use it for affiliate purposes freely. Now once again instead of going through (b) and (c) above, I would like to recommend Wealthy Affiliate – it costs you $49 per month or $359 per year, with 7 days free trial, but with Wealthy Affiliate, you can create as many websites as you like. Whereas as I mentioned above, web-hosting will cost you $50 – $100 per website. Plus there are incredible amount of support and affiliate training from many specialists available. They will teach you how to start from scratch, step by step. So I think it’s well worth joining Wealthy Affiliate. This is very straight-forward. The easiest way is to Google it to find affiliating companies. Again with example of sola lamps, usually electrical home store would sell solar products, so just try typing in a big superstore that you know “XYZ electric shop affiliate program“, or simply type in “solar lamp affiliate program”. Let’s actually try it now. I live in the UK, so can see some UK site, but it should come up with your local companies, or you can search some more for the targeted country, by typing e.g. 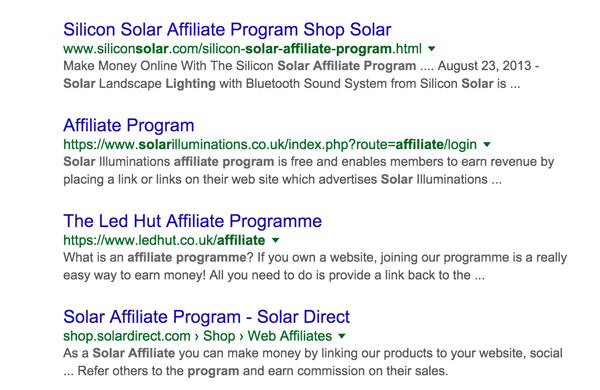 “solar lamps affiliate program New Zealand” etc. bestbuy.com deals with electronics and sells a lot of solar lights, so you can google “bestbuy.com affiliate program”. Another way is to register with Amazon Associates. Amazon sells almost anything, and you could promote their products on your website. https://affiliate-program.amazon.com is for the US Amazon, or you could again google “amazon associates” “amazon affiliate” and register your detail. Your company name – often it is a mandatory field. You just have to type in your full name again, unless you are promoting their products via a company you own. Your website address(es) – a lot of affiliate marketing programs such as Amazon allow you to register multiple websites. 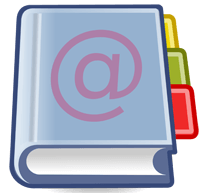 What kind of site you are running – Are you a personal blogger? Retailer? What kind of industry are you in? If you are reading this now, assuming you will be a personal blogger. Often they will ask you to “appeal” in a message boxes. “How do you want to promote our products?” – the answer to which would be “advertise on my website”! But you’d like to express your wish in a bit longer sentence to convince them. 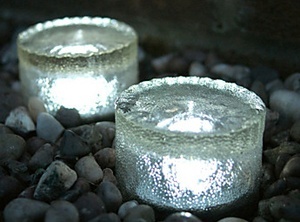 You have just launched a new site to promote solar lamps, and you like the range of lamps they are selling, etc. Once you register with them, they will review your registration, either approve or disapprove and let you know in the next few days. Some companies automatically and instantly approve your registration, but mostly the process is manual (they do review and check what your website currently looks like). 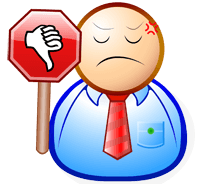 You’re registration may be rejected, but don’t let it get you down, try another affiliate marketing program. Or re-appeal (re-register) in a few months time, when your website has more contents and hopefully more visitors. If you have just launched a site to promote a clothing range and try registering with big brands such as Gucci, Chanel etc, they may reject you because understandably, they can’t trust you yet. How would they know that you’d never lie about their products? Whereas a lot of companies are supportive, and the affiliate representative often sends you a personal email wishing a good luck to your new web business. When your registration has been approved, you are now able to log in, first you need to check your account detail once again. Most importantly the payment method. Options are often by (a) bank wire transfer (b) by check or (c) by Paypal. Paypal is handy, because all you have to do right now is to put your registered Paypal email address. Wire transfer can be tricky if you reside in a foreign country, for example your affiliate advertiser is in US but you live in the UK, they may deduct the wire transfer fee of $30 or so. It may be free and it will tell you in the option box. Check option is again, if you live outside the country, the check will be in a foreign currency, so when you deposit the check, a hefty bank charge may be deducted. Another thing is your income tax declaration. You are often required to fill in an online tax form, most likely with US affiliate advertisers – if you are a US citizen, you must fill in your tax registration details and if you are a non-US, check the appropriate box to declare so, click to submit. This process will not take a few minutes. Now at last, you are able to write about the products/services you want to promote, and link your page to the company’s page. In your affiliate account login, there should be a tab or menu called “Links/Banners”, where you find a “HTML code” to copy and paste onto your site. For example let’s take a look at Wealthy Affiliate again – this is to promote Wealthy Affiliate Marketing Program itself. You like about Wealthy Affiliate and you want to promote them – you want your visitors to join them. You see the code in the grey box above – you copy this code and paste it onto your website. In most of the web-writing tool, there should be two separate windows; a window you normally type in (“WYSIWYG“) and a window that shows HTML code. In WordPress, it’s shown as “Visual” tab and “Text” tab respectively on the top-right corner. You click “Text” and you’ll see all the coding structure. You will find where to paste the code by trying & testing. I’m going to try pasting directly below this very paragraph now. Now the banner is in my site, as below. And if a visitor clicks this banner – it will take the visitor to the Wealthy Affiliate site. In this example, you’ll see where says a_aid=67c7e161 within the code, this is my unique number, and your have your own unique identification letters/numbers within the code for each affiliate marketing program, so that when your visitor clicks and buys the product, the affiliate company can identify the visitor has come via your website. (2) Highlight which text you want link the page to, e.g. “Join Wealthy Affiliate – Click HERE”, so you highlight the word “HERE”. (3) There should be “Insert HTML” icon in your web-writing tool, so paste the code. In WordPress, it’s within the top menu. I hope the above explained all you need to do to get an affiliate work started. Among the four processes above, I would say 3 and 4 are not as difficult – or not as important as 1 and 2. You need to plan well in the beginning. What niches you want to promote, and how you want to name your own website, because this is going to be your brand, and without planning properly you may get bored easily, or even start to dislike your own brand in the future. Therefore good planning is the key to the longevity of your affiliate business.